** Please Note: The reduced priced stock is less than 12 months from expiring. 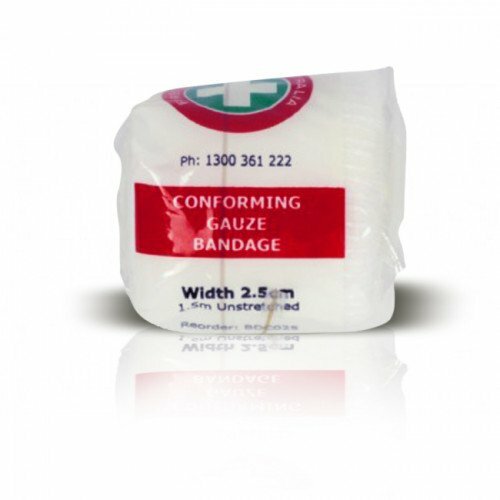 Conforming Bandage - 2.5cm x 150cm sterile (with use by date) this is a must for every office and home first aid kit. Our self labelled product is in fact a SENTRY Medical Conforming Gauze Bandage which is constructed from a blend of Polyamide and Rayon. They are durable and suitable for supporting and relieving injured joints. It is suitable for use as dressing retention on high body movement areas such as the wrist, thigh, and knee injuries. Our unstretched conforming bandage is 150cm long and comes in three different widths to better suit usage on different joints. Firmly wrap the injured area using a figure 8 shape, or overlap for limb areas such as forearm or calf. Ensure that the areas above and below the injury are covered. Always ensure the binding is comfortable. Should any numbness or tingling sensation arise, unwrap the bandage & rebind less tightly.